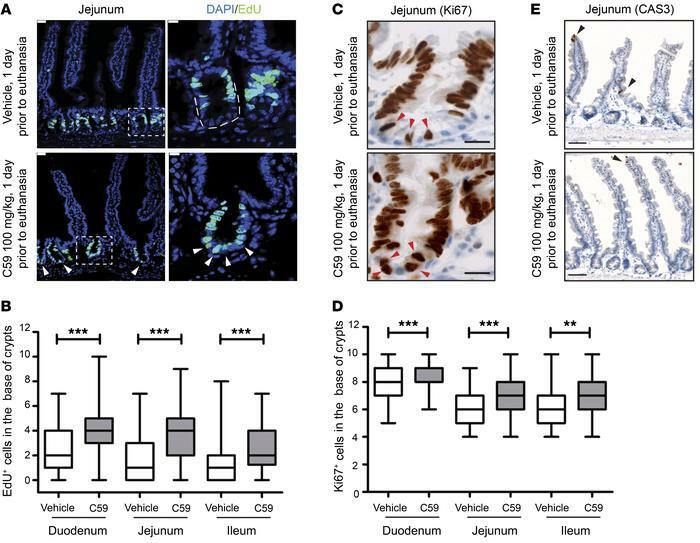 Wnt inhibition enhances proliferation of intestinal stem cells. (A) C59 induced proliferation in the crypt base. Representative images of jejunal samples from mice treated with 1 dose of vehicle or C59 (100 mg/kg) 1 day prior to euthanasia. Proliferative cells were marked with EdU given 2 hours prior to euthanasia and DAPI stained the nuclei of cells. Arrows indicate EdU+ cells in crypt base. Scale bar, 25 μm. Image on right is higher magnification of outlined area of crypt (scale bar, 10 μm). (B) Quantification of EdU+ cells within 10 counted cells in the crypt base. Fifteen to twenty crypts were counted for each region of each mouse intestine (vehicle, n = 9 mice; C59, n = 8 mice; 3 experimental replicates). (C) Representative images of Ki67 staining in the vehicle- or C59-treated mice. Scale bar, 20 μm. Arrows indicate Ki67+ cells in the crypt base. (D) Enrichment of Ki67+ cells in the crypt base of vehicle- versus C59-treated mice. Twenty crypts were counted for each region of intestine per mouse (vehicle, n = 4; C59, n = 7; 2 experimental replicates). (E) C59 does not induce apoptosis in intestinal crypts. Representative images of cleaved-caspase 3 (CAS3) staining in jejunal sections of mice treated as described above. Arrows mark the apoptotic cells in villi as an internal positive control. Scale bar, 50 μm. ***P < 0.001, Mann-Whitney U test.